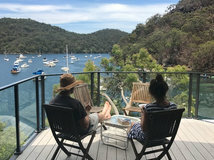 Cut off from town water and thousands of kilometres away from the busy professional lives of its owners, this far-flung holiday house is dislocated from reality in the purest of ways. Welcome to Bruce and Rachael Jackson’s home away from home. 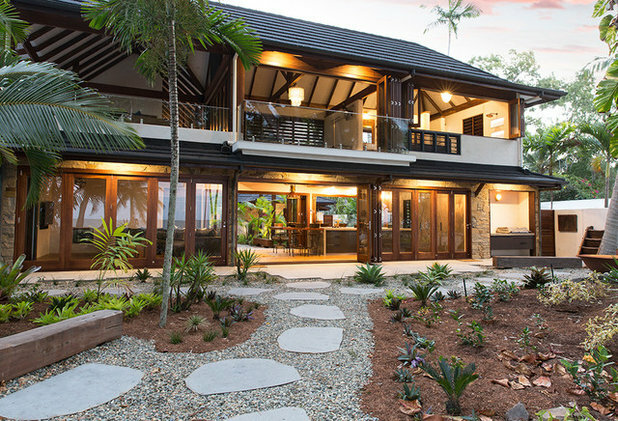 The couple, who lives in Sydney, had owned this Far North Queensland property for many years. But it wasn’t until 2015 that they demolished their original two-storey house to make way for the beachside retreat you now see. 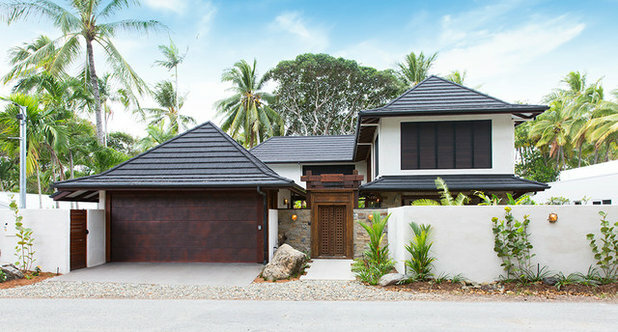 The Jacksons competitively tendered the project to local preselected builders and chose Nathan Verri from Port Douglas to construct their home. At the helm of the new design stood Sean Reason, director of bàlay Vandyke, who led the charge until the build was complete in 2017. 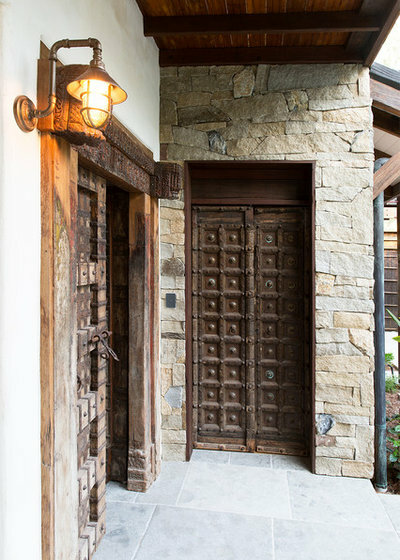 The Jacksons personally sourced the vintage timber front doors, travelling to India to find the handcrafted, vintage Rajasthani pieces themselves. Rest your palm on their carved surface and you’ll feel the rich grain of the timber; push them open and you’ll step into a different world. 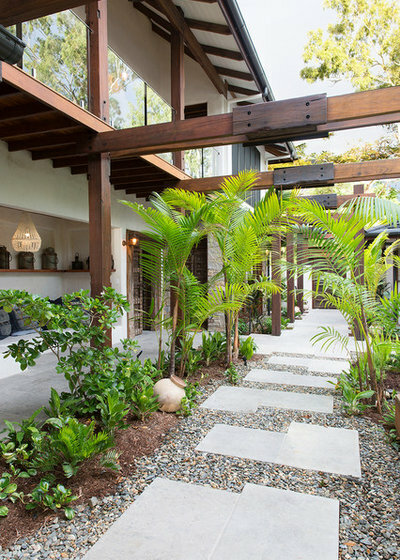 The moment you cross the threshold and shut these doors behind you, you will feel a departure from the daily grind as you arrive in a tropical sanctuary. 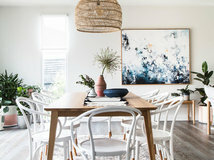 It does exactly what every holiday home ought to do, and bàlay Vandyke achieved this – together with the Jacksons – through careful design and material selection. The initial concept design was not rushed. It evolved over nine bespoke designs, and was only finalised when every space fulfilled the clients’ vision. 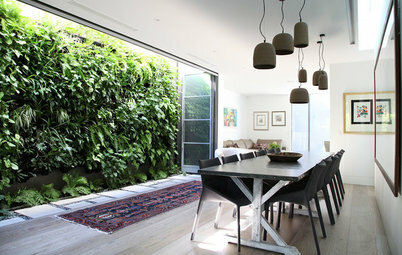 The result is part home, part habitat, where the distinction between interior and exterior is blurred. 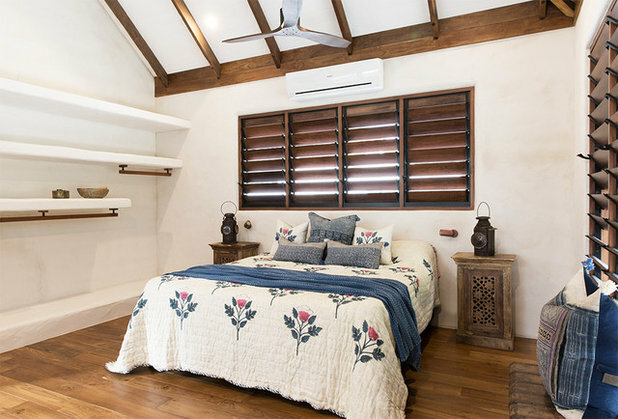 Just as this guest bedroom reaches out through the greenery from the body of the house, separate wings and rooms are linked by arbours and alfresco areas. 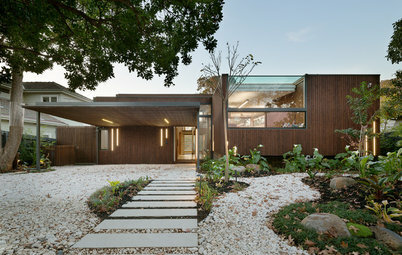 This is a home where the great outdoors are as much a design feature as the structure of the house itself. 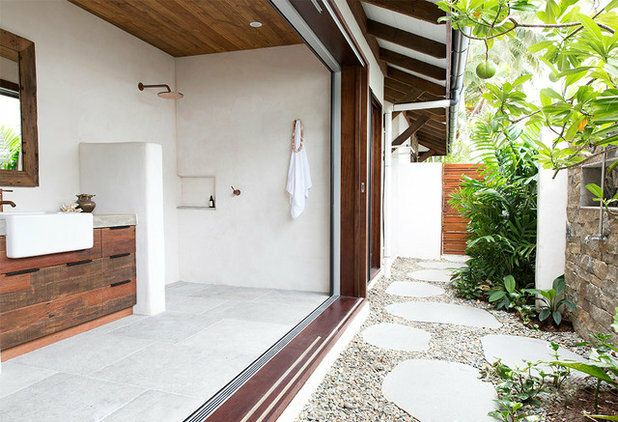 Instead of shying away from the elements, this ground-floor bathroom and connecting laundry embrace nature with an outdoor shower and retractable doors and screens. 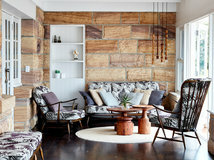 To achieve this, Reason eschewed glitzy on-trend products in favour of recycled materials, natural patinas and earthier elements. 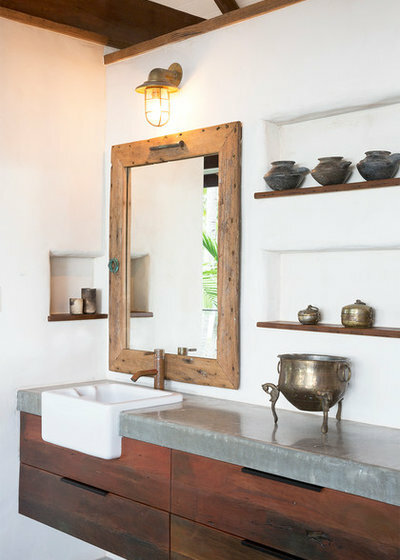 He paired these with custom-designed, cast and hand-rendered concrete accents, such as the bathroom vanities and wall niches you see throughout the house, including in this ground-floor bathroom. 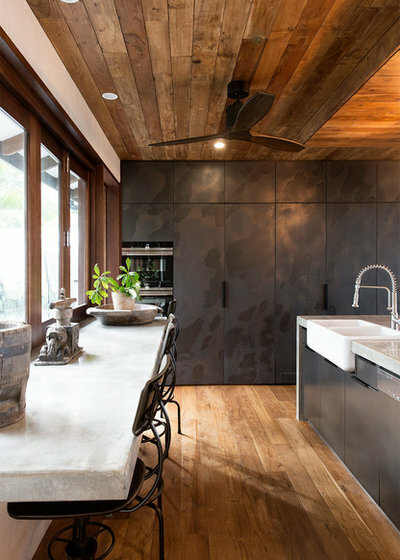 The ceilings – often forgotten surfaces – were also hand-rendered with an undulating concrete, then Reason added timber rafters to the undersides to infuse them with texture. 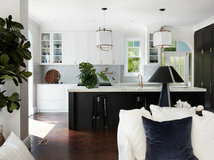 The owners were closely involved with every design decision and Reason credits their architectural vision and exacting tastes to the overall success of the build, describing it as a team effort. 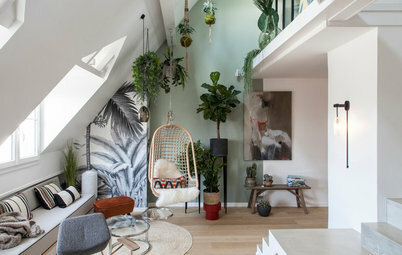 Vintage finds and decorative objects from the couple’s travels pepper their home and make an appearance here in the reading nook, which flanks the arbour that leads from the front gate to the main living area. 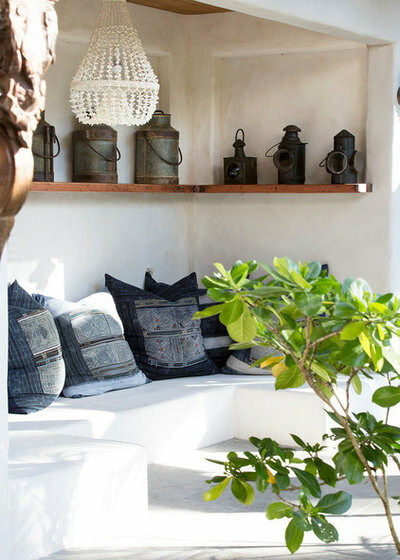 Look closely at the Jacksons’ holiday home and you will spy a mixture of Moroccan motifs, Indian influences, Balinese flourishes and a Mediterranean flavour. Reason also gave careful consideration to the relationship between the Jackson’s holiday home and its immediate environment. “Spice at Oak is cut off from town water and waste services, so we needed to accommodate and design 60 kilolitres of water storage beneath the garage, but contend with a rather high water table,” he says, adding that this presented one of the biggest challenges of the entire build. The central hub of the home is its open-plan kitchen, living and dining area, which runs through the site like the spine of the home. On either side are picturesque views, not dissimilar to lungs, which offer adjacent outdoor ‘breathing space’, encouraging you to take a deep breath and relax. 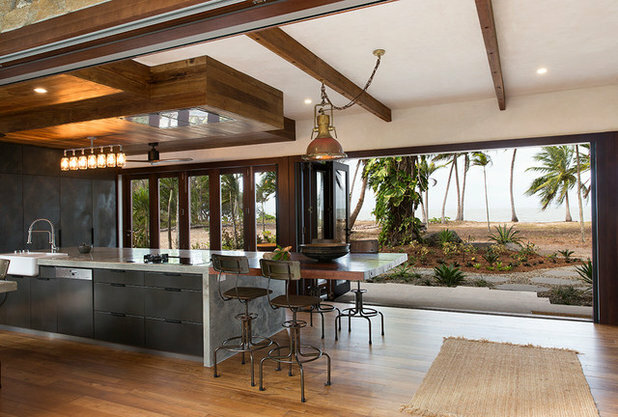 “By opening the custom-made bi-fold doors to each side of this space, the ground floor is then interconnected to the beautiful outside, essentially borrowing that space too and making everything feel automatically larger,” says Reason. 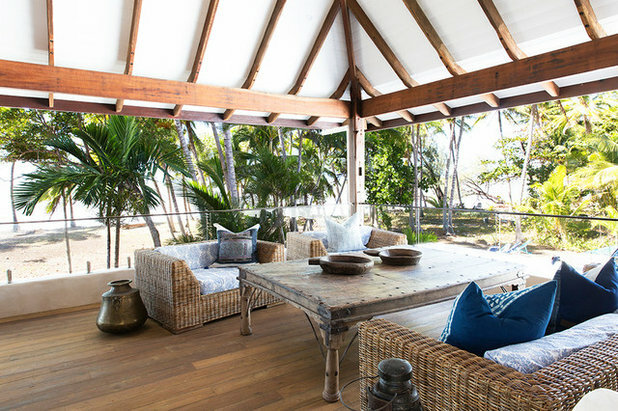 On one side of the living area, the sand of Oak Beach runs parallel to the home and the Coral Sea beyond. On the other side of the living area you find the pool and outdoor cabana with the rainforest in the distance. 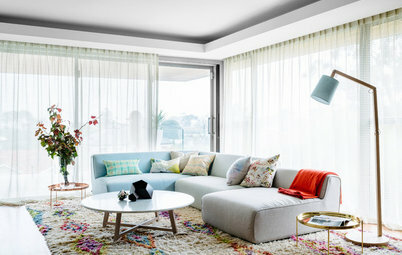 During their time in Sydney, the Jacksons rent out their holiday house, so a touch of resort-style luxury was an important aspect in the design. But together with bàlay Vandyke, the couple resisted letting the design fall victim to the impersonal style of many hotels you find around the world. 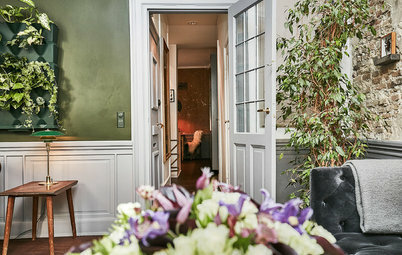 Instead, it was equally important that the house felt like a home away from home. 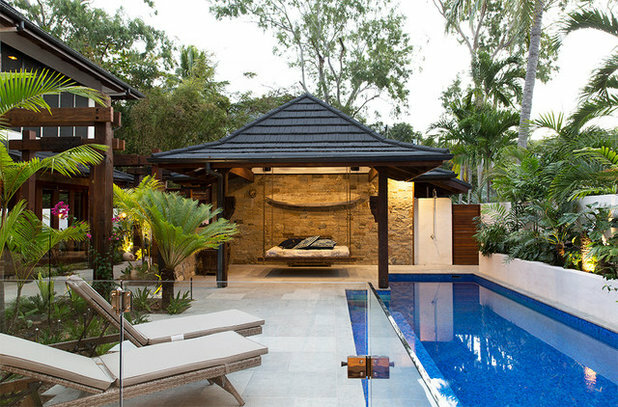 “The cabana area, which has a private open bathroom also tucked around the corner so wet feet don’t need to enter the home, imparts a resort feel with the floating daybed,” says Reason. Venture upstairs and you are greeted by more sweeping views of Oak Beach on one side and the pool on the other, with a communal indoor-outdoor balcony. 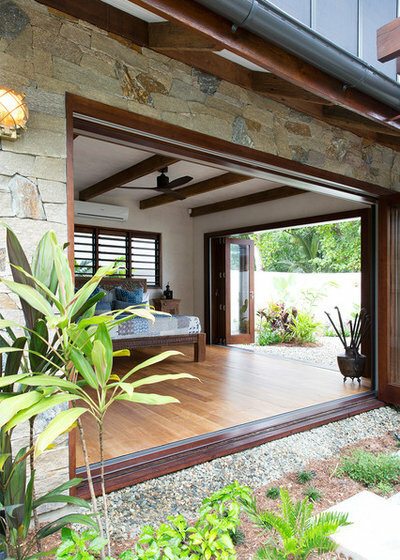 Reason custom-designed Queensland maple bi-fold doors and screens to run the full length of these open indoor spaces, to protect the home’s occupants from mosquitoes and the elements. 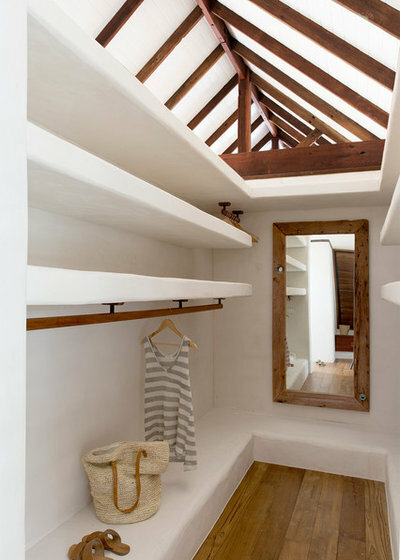 To echo the ground-floor ceilings, bàlay Vandyke also added timber rafters to the undersides of the upstairs ceilings. 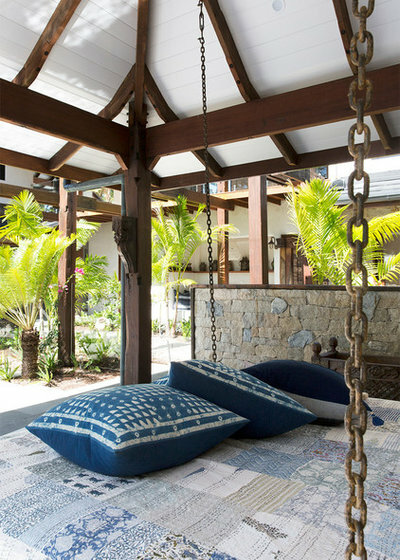 Combined with the blurred line between indoors and out, this adds to the tropical bungalow feel of the home. 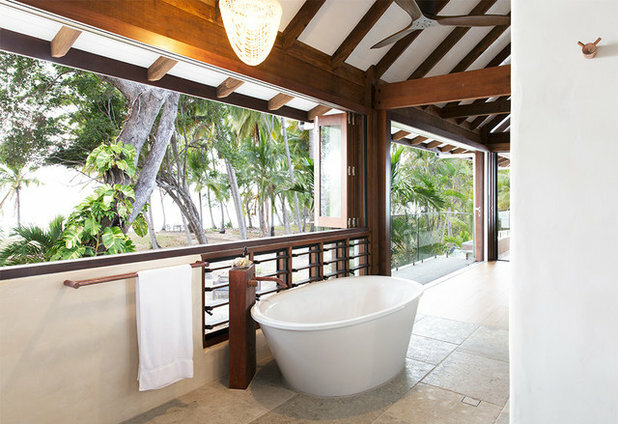 Ask Reason which features he is most proud of and he speaks of the timber work and the specially cast concrete, which you see throughout. 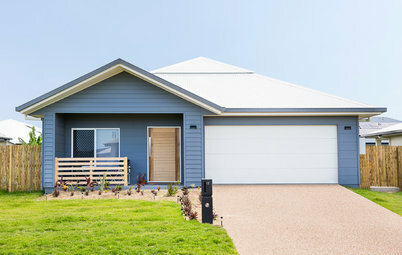 Reason added white oxide to the concrete render to negate the need for paint and let the textural quality of the material stand as a feature in its own right. 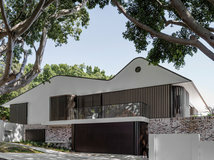 The concrete is also distinctive in design because it makes an appearance in places where you would normally expect to find joinery, such as the shelving and storage space in the upstairs bedrooms and walk-in-robe. 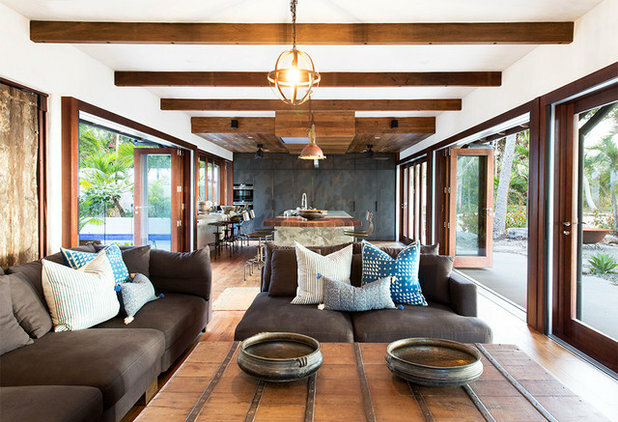 What do you love about this tropical holiday home? Tell us your thoughts in the comments below or share, save and like this story. how do you rent out? It is STUNNING! Thanks for your comments everyone, keep them coming. 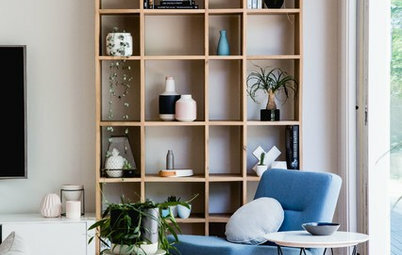 @housestuff99, I believe all the concrete shelving and surfaces are unpainted; the builder added white oxide for that bright, fresh colour. 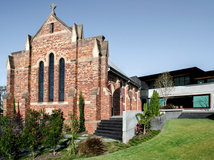 @mosssusan51, here's the link to this property at the top of the story: https://spiceatoak.com.au. I'm sure they'll have more information for you there. Thanks. That is a really welcoming place to take a vacation. 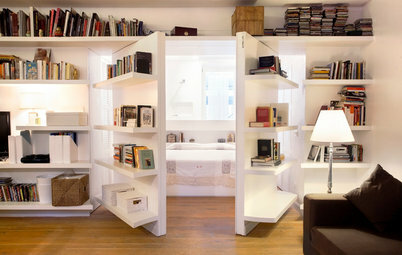 I would imagine it can recharge your mind and spirit in a short time. It is vibrant and soothing in so many ways!